Okay, I sweat a lot. So sue me. Especially at work, I feel like I am always burning up! I am always afraid that my deodorant won't do a good enough job, and that I will sweat through my clothes. This freaks me out, and I am always going in the bathroom and checking out my shirt. 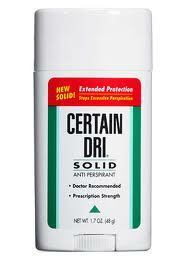 Certain Dri is an antiperspirant that you apply several times a week before bed. It is colorless and fragrance free, so it is great for people with sensitive skin. It is the strongest antiperspirant available today without a prescription. You will never believe this! Certain Dri is also recommended by doctors to help sweating of the hands and/or feet. You just do the same thing, apply it at bedtime and let it dry! I have been using Certain Dri for a few weeks now, and I really like it. It was kind of weird to get used to putting it on at bedtime. I have noticed that I am not sweating as much, which is definitely nice! I am going to try the Certain Dri AM refresher too, just so I can have something to put on in the mornings so I am not feeling all dirty by not using anything! Make sure to join Certain Dri on Facebook and Twitter! Would you like to win a Certain Dri Solid? Go here to the Certain Dri Website and come back, leaving a comment telling me something you learned. Contest is open to US only. Contest will end on 12/16/2010 at approx 10pm. Winner will be chosen via random.org and will have 48 hours to respond to email notification or a new winner will be chosen. Prizes are shipped by the sponsor, so I am not responsible for prizes that are lost, damaged, or otherwise not received. Disclosure; i received a sample product in order to facilitate this review. Although a sample product was received, all opinions are my own, and no monetary compensation was received. hours and it best put on at night.